What is a Minnesota Last Will and Testament? 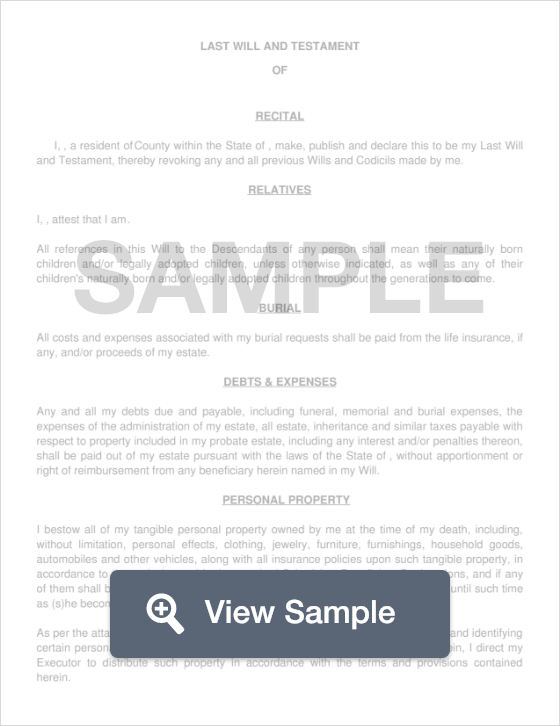 Minnesota Last Will and Testament: What Is It? In the state of Minnesota, a Last Will and Testament is a document that allows a person (known as a Testator) to legally distribute their assets, their belongings, their property, and anything else down to their beneficiaries without worry that these assets will be taken by someone else. As long as a will is signed by two witnesses and notarized, it is legally recognized by the state and can be upheld in court should any disagreements occur. Witnesses - According to Section 524.2-502, the Will must be signed by two (2) witnesses. Also, name whether or not your spouse will be named as a beneficiary. Children - Names, living status, and whether or not he or she will be named as a beneficiary. Step 4 - Provide the percentage of your assets or the amount you’d like to leave each child. Step 5 - Specify who you wish to set up a Trust for. Setting up a trust for someone who receives Supplemental Security Income or Medicaid can prevent any eligibility issues with their benefits. Step 6 - List the stipulations on your children’s inheritance. For example, list when benefits will begin, end and what portion they will receive. Step 7 - If you have any specifications on your funeral home arrangements, list those here. Step 8 - If you have any specifications on the last meal after your service, list that here. Step 9 - Provide the name of your Executor as well as your relationship with them. Be sure to name an Executor as well as an alternate. If you neglect to appoint an Executor, the courts will appoint one for you. Step 10 - If your assets are set up in a Trust, provide the name of your Trustee as well as their relationship to you. Step 11 - If you have digital assets, such as copyrights, royalties, digital currency etc., provide the name of your Digital Executor, as well as his or her relationship to you. Step 12 - If you have minor children, provide the name of someone you trust to act as their Guardian and their relationship to you. Also if you wish to appoint an alternate or a Conservator, provide that information in this section. Be sure to have your document signed and notarized by all necessary parties for it to be legally recognized by the state and other pertinent institutions.